Rushy Field in Grizedale. Oil on gessoed card. 6"x8"
This sketch was done very quickly after a long afternoon painting. I noticed the new leaves on the trees across the field as I was returning to my car. 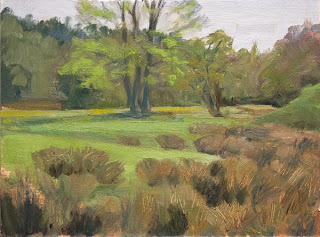 I also liked the contrast of the bright greens with the warm colours of the rushes. So I quickly unpacked my gear and did the sketch. I'm quite pleased with some of the value relationships.